Aakash iTutor videos for medical, engineering aspirants are available with Aakash iTutor. These video lessons are designed and delivered by best teachers from Aakash Institute. Students can download the free mobile app and avail best features of Aakash iTutor at the best price. You can either purchase the entire course or can just buy specific subjects/chapters. 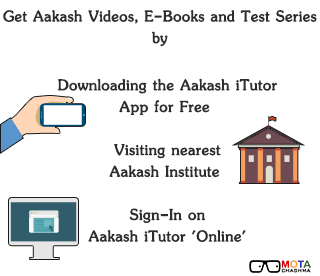 Mobile freaks can also download Aakash iTutor App for free and get access to all the video lectures (first 3 minutes) at Zero cost. Since the technology reaching to new peaks every day, Aakash Institute launched Aakash iTutor App for tech-savvy candidates who aspire to achieve success in various Entrance Exams (NEET and JEE), foundations or board exams. As we have already discussed the benefits in the preliminary blog, now we are moving forward by shifting all the attention towards Aakash iTutor videos, diverse Courses, Price, Apps, Features and others details. This article contains details on Aakash iTutor App and its features, courses price etc. Scroll down to read more on Aakash iTutor videos: Free App Download, Price, Features. Free Access: All the candidates get free access to first three minutes of the video lectures. Online & Offline Mode: Candidate can study with or without the Internet connection. Compatibility: App is compatible with Mobile, Tablet, and PC as well. Download for Free: Candidates can download the videos and continue their study in offline mode as well. Daily Quiz: Students can take a quiz on daily basis to measure their performance. This helps the person to assess his/her own knowledge and analyze their learning. Online Doubt Clearing: Its ‘Ask an Expert’ features make it demanding and trendy among youngsters. Fit Anywhere: The App size is not more than 16 MB so easily fit in your mobile space. Easy Sign-In: Candidates can easily Sign-In using their Gmail or Facebook accounts. Taking care of all aspects, Aakash iTutor contains high-quality videos and E-books and its flagship All India Aakash Test Series (AIATS). In addition, students can also avail Aakash iTutor for less than half price compared to regular classroom expenditure. Following are the details of diverse courses for those enrolling in Aakash iTutor. Prices given here are to just give you an idea of the course fees. Institute may change the prices. Students who don’t want to purchase the entire course can buy only specific subjects/chapters, these are available at prices starting from Rs. 99 (Per Chapter) and package’s prices start at Rs. 10,899. Aakash Coaching for NEET/ JEE Main 2019, 2020 - Register Now!